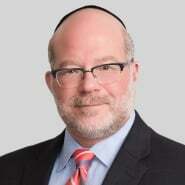 Jay Levine, a partner in Porter Wright's Litigation Department in the firm's Washington, D.C. office, was quoted in the article "Drugmakers defend no-cash patent deals post-Actavis" published in the Competition Section at Law360.com. The article discusses recent litigation in the wake of last year's U.S. Supreme Court landmark antitrust decision in Federal Trade Commission v. Actavis, and how this and future rulings will dramatically shape the structure of settlements between brand-name and generic-drug makers. "'Drug companies are ... going to have to devise new types of settlements,' said Jay L. Levine of Porter Wright Morris & Arthur LLP. 'They're extremely creative ... and they're going to test the waters.'"